W A L L S T O R A G E F O R Y O U R K A Y A K S! against competitors' bent 1" steel pipes with a cheap sleeve OR those awkward strap hangers! Yuk! 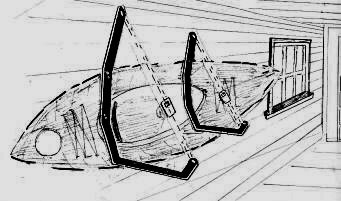 Same proven shape as our original Multi-Purpose J-CRADLES, but at a reduced price for kayak storage only. Designed to hold a single, tandem OR sit-on-top kayak. Can be mounted to a studded wall, post or even a concrete block wall with optional TapCon® concrete screws! Add $28.50 for a set of 8 TapCons®, concrete drill bit and the TapCon® driver. Best installed with a hammer drill (not included). Don't have a wall to store your kayaks on? - Click here to see our outdoor Kayak Tree. Heavy Duty Stainless Steel - Real Rubber Padding. 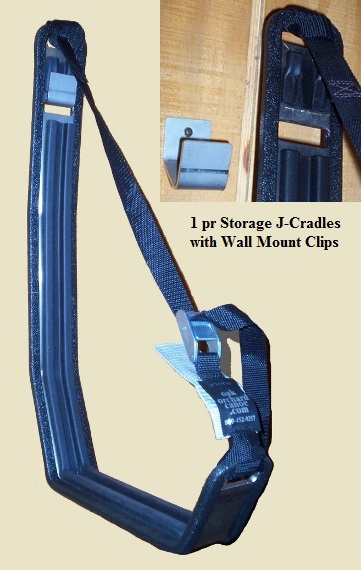 Includes Straps and mounting clips! 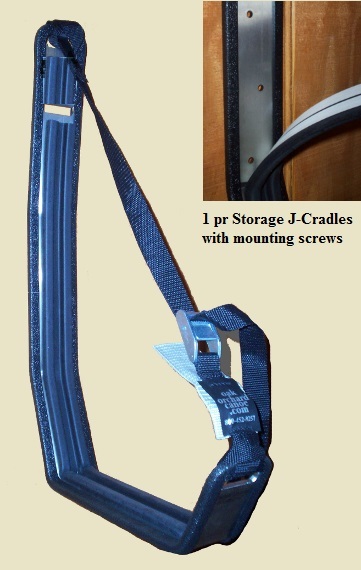 for 3 mounting screws, OR see our optional "Wall Mount Clips". We've had customers make their own back yard "kayak tree" using our "J-Cradles". Some mount them to RV - trailer sides, post, tree and big power yachts! 2.5" inch wide, thick rubber padded area will hold your boat carefully. Not like competitors flimsy round 1" pipe with a cheap sleeve covering! Check them out... but purchase ours! 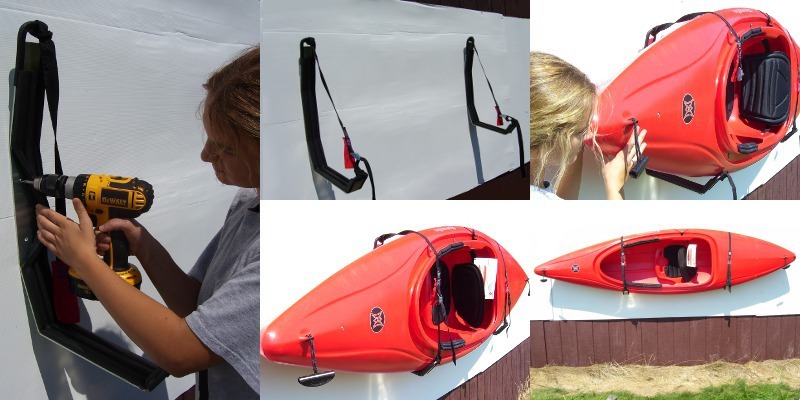 The typical garage wall can hold 3 to 4 kayaks high using Oak Orchard's J-STORAGE CRADLES. Easy one person load - No dangerous ropes, pulleys or 2-3 people to load and pull. 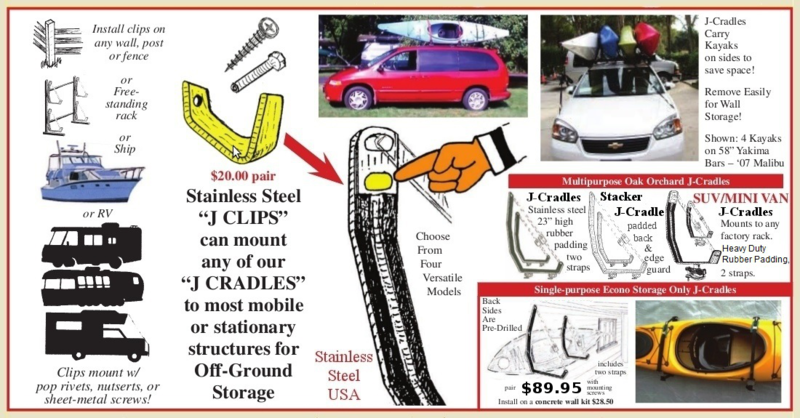 Order our KAYAK STORAGE J-CRADLES, today! 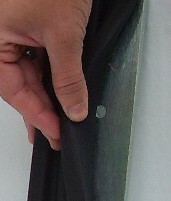 Notice the upper section of padding is purposely not adhered. Pull aside the padding in this section to reveal the pre-drilled mounting screw holes! Easy huh?? Weight Limit?? If you can lift it, our stainless steel wall J-Cradle will hold it. Beware of competitors light duty, one inch round 1" tubing J's with a cheap sleeve covering. Choose from 4 styles - Standard, SUV & Storage Only! Fits All Kayaks! Short, Long, Sit-In, Sit-On! Even Tandems!